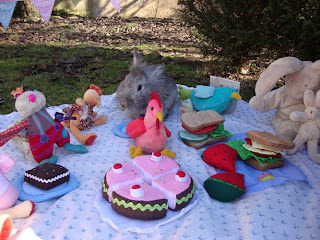 Well my week with Ernest is just about up and before I send him on his way I decided to throw him a little tea party in the garden. 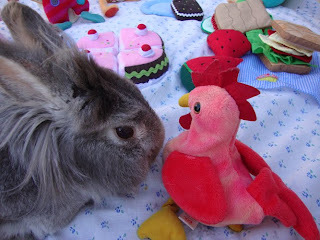 A whole host of friends came along - including Ernest's new lady friend, Felicie Hen. And of course Humphrey turned up - not like him to miss anything involving cake. 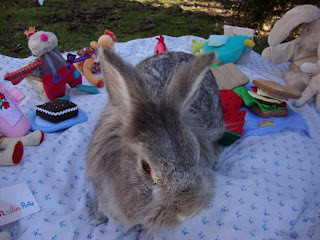 The sun was shining and we had a lovely picnic using some of my new Oskar and Ellen play food. 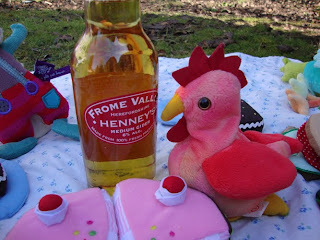 I even served up a bottle of Mike's cider - well, with a name like Henney's it seemed inevitable - but only a thimble full for the little ones of course. Hic! ....So, I had a little draw and am delighted to announce that Ernests's next port of call will be....... over at Pomona's place: http://littlecottagecomforts.blogspot.com. I think he's going to love it there as apparently there are some real life hens for him to meet! (Pomona - please can you email me your address, then I will send Ernest on an overnight delivery). Well we'll be sad to see him go, but it's been great fun having him to stay. It's just you and me again Humph! Humphrey seems to be enjoying the party too! The hens are all of a flurry and flutter! what a scrupmtious tea party ! Cider too Hic !